Photo by Carol Grosvenor of Michele Petty and Contessa. From Austin exit 290/71 west, 290 and 71 will split, stay to the right going northwest on 71, turn right on Pace Bend Park Road (RR 2322), this is a lighted intersection and you will see a large Chevron gas station which also has a Grocery Store (Paleface Grocery – a good spot to get ice and what ever else you might need). 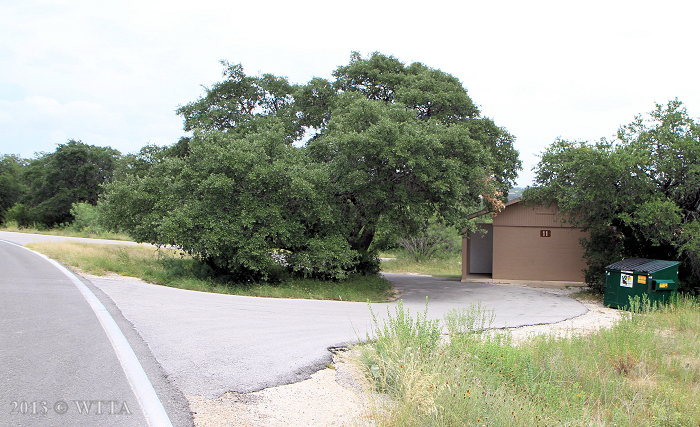 Pace Bend Park road will dead end right into the gate house of the park (you do not have to turn off of this road which is approximately 4 miles long). Once at the gate house be sure to ask for a park map and trail map. You can also get these maps on-line, see the links below. Courteous bikers dismount their bicycles and slowly walk by - Thank you! Fees: Credit/Debit cards are not accepted. Fees may change or vary so be sure to call the park for the most up to date information. Primitive camp sites (400 sites according to their webpage) are open for equestrian users while the improved campsites (20 sites) with water and electric do not allow horses. Most of the primitive camp sites have picnic tables, grills, fire rings, and shade trees. There is no running water at the primitive sites. The park has waterless restroom facilities numbered 1 – 15 throughout the park located off of the paved main loop park road. 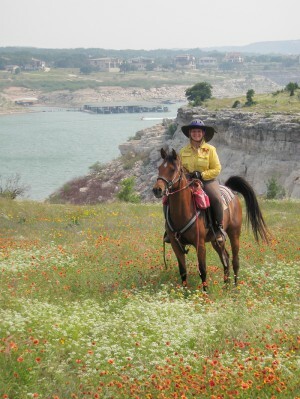 If you enjoy trail riding but also love to kayak, you can accomplish both at Pace Bend Park. 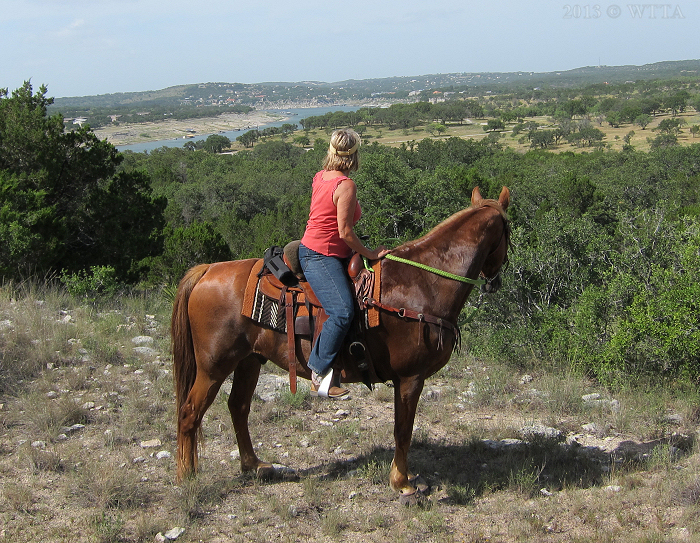 The park is managed by the Lower Colorado River Authority and is one of several Lake Travis recreation areas which allow horseback riding. The 1,368 acre park is just a few miles northwest of Austin, tucked into a bend of Lake Travis. 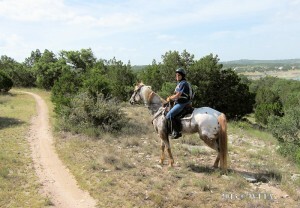 For equestrians the park allows day use and overnight primitive camping. A seven mile paved roadway loops around the park perimeter. Beach access to the lake is outside of this loop and marked trails are located inside the loop. Horseback riding is allowed in both the interior trails and outer loop areas. The interior marked trails are shared with hikers and bikers. Motorized vehicles are not allowed on the interior trails, as this part of the park is managed as a wildlife preserve. 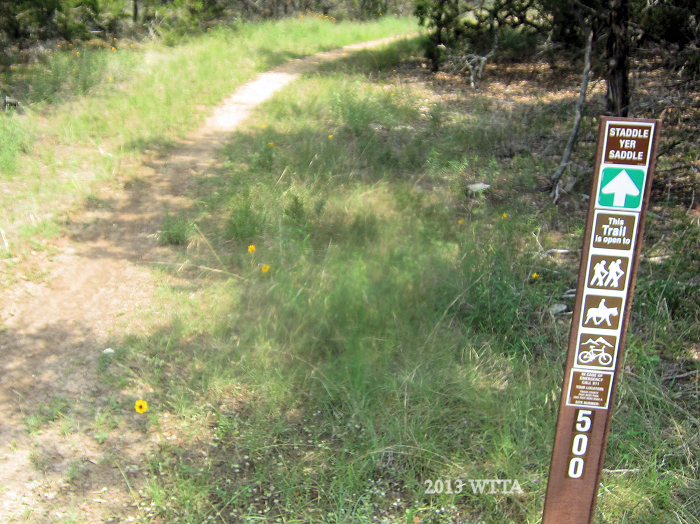 Some of the trails are marked as “hike and bike only” trails (no equestrians). 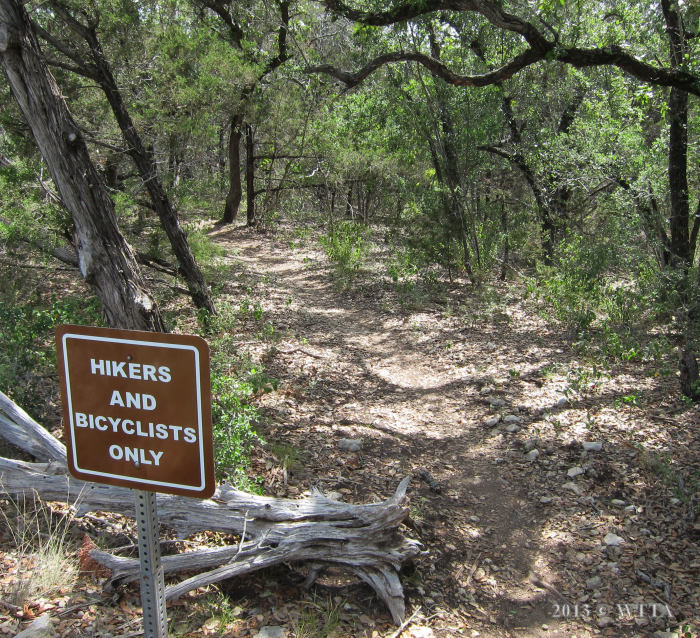 When first exploring the interior trails, it can get a little confusing and easy to find yourself on a hike and bike only trail, as they are not marked at every intersection. 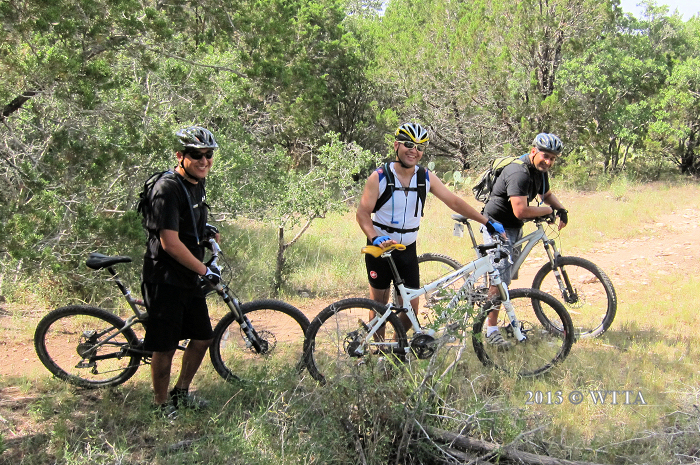 If you find yourself on a trail with lots of low hanging branches then you just might be on a hike and bike only trail. 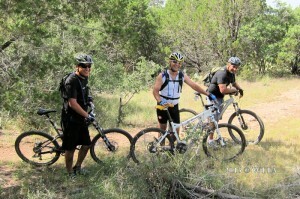 The park is a popular spot for off-road bikers. During each of my visits we encountered bikers on the trail who were considerate and polite, but seemed surprised to see horses! Keep this in mind when riding, as it is not uncommon to have bikers come up from behind or in front and they are not necessarily looking out for horses. In fact many park goers seemed surprised to see horses in the park, which made me wonder how often trail riders frequent this area. Beth with her Walker, Patience, enjoying the view. 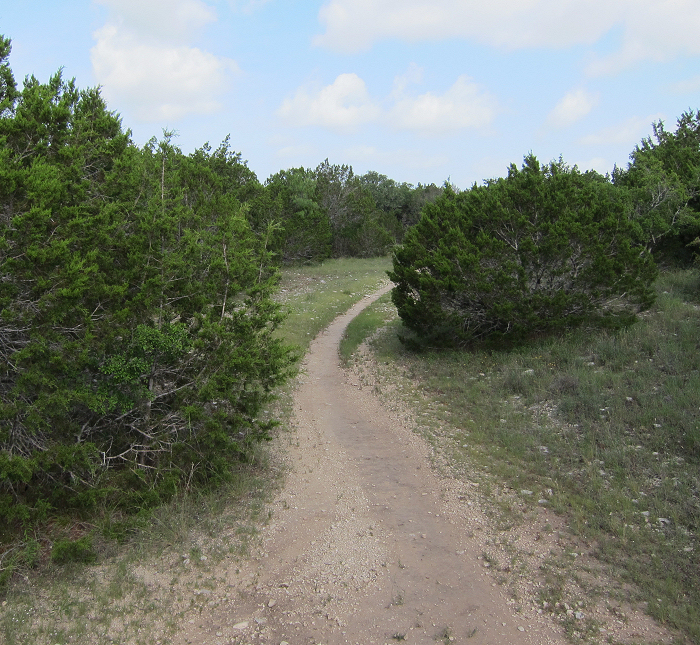 The interior trails weave in and out of oaks, cedars, and Texas wildflowers. 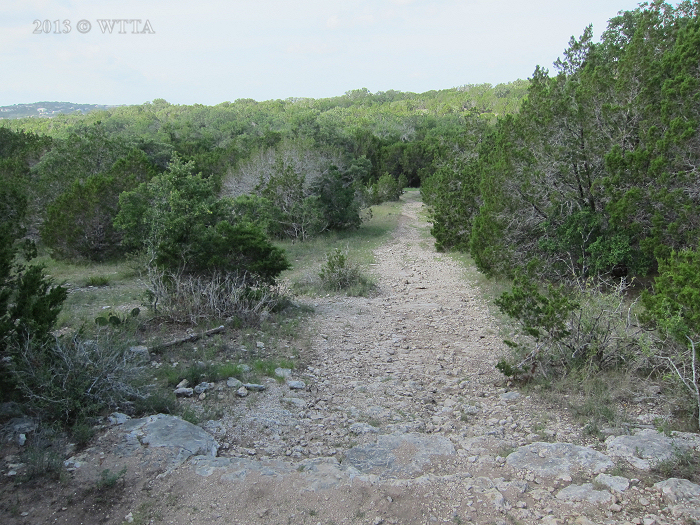 The ground consists of typical Central Texas Hill Country limestone surface which makes shoes, boots, or amazingly tough hooves a necessity. The interior trails are at a higher elevation and offer some gorgeous Lake Travis views where you can see all the lake action. Riding outside the loop offers almost constant views of the lake, but also puts you in the middle of all the beach activity. A day use area northwest of Mud Cove located outside the park loop road is quieter and opens up into some unmarked trails. Riding along the waterfront or into the lake itself is risky, and when lake levels are low it is just plain not advisable. I’ve heard of some occasions where horses sank in the unstable soil. During my last visit in June, our friends who arrived a day before us experienced this first-hand when their horses sank along the water’s edge, causing one horse to fall. It was a close call but they were all right. Water sources on the trail are scarce with exception to the lake, but as stated that could be dangerous. I saw only one water source, a water tough, on the interior trails located by a chain link fence near trail #208. Our campsite in the Mud Cove area. Primitive camping at the park is on a first-come, first-serve basis; reservations aren’t taken. Make plans for an early arrival to scout out the best spot. 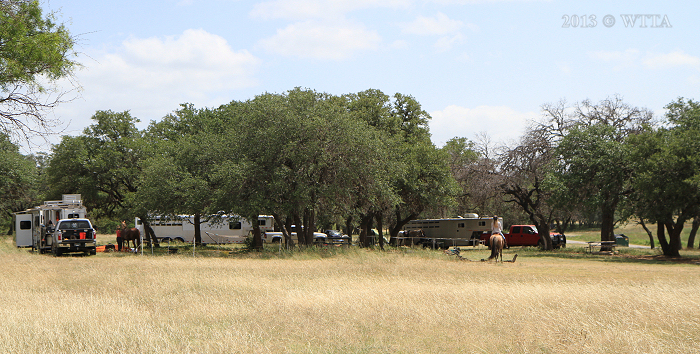 Mud Cove, located on the northeast side, is one of the better areas to camp with your horses. 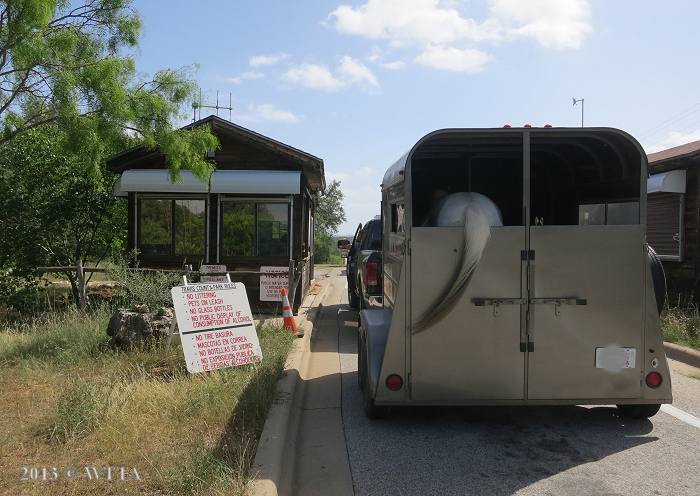 When looking at the Pace Bend Park Visitor’s Map, Mud Cove is near restroom #11, this restroom can also be seen from the main park road. 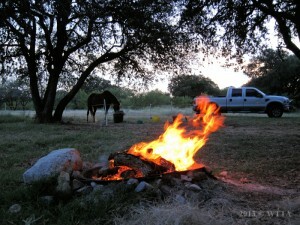 Many campsites have picnic tables, grills, fire rings, and tall shady oak trees. There are no pens, but portable or electric pens are allowed or you can high-tie your horses but be sure to use tree savers. 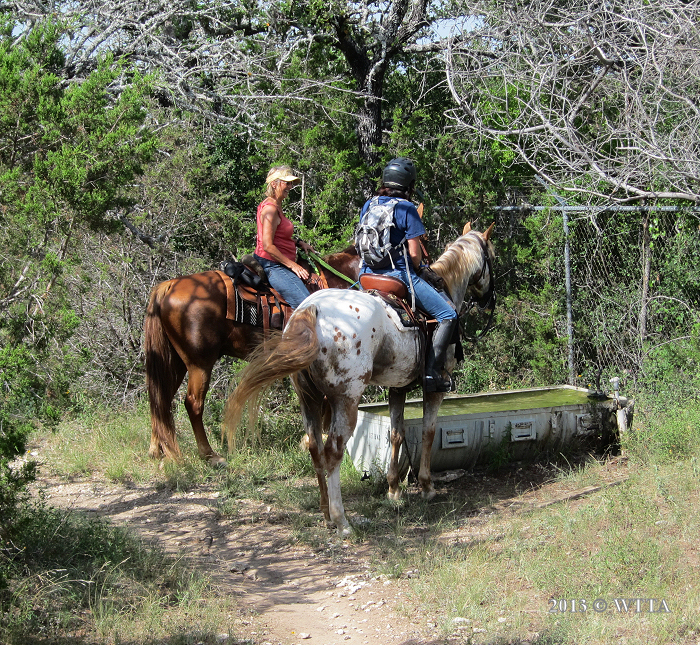 No running water is available at the primitive sites; youmust bring water for your horse and yourself. Quiet hours (no generators, music, etc.) are enforced from 10pm to 7am. Bring your puppies but keep them on a leash per park rules. My dog, LB, loves to accompany us on our camping trips but she did not like our first trip to Pace Bend as the campsite was full of burrs. She would pick up one in her paw and stand still as a rock until we pulled it out. On our last visit during the Super Moon weekend in June, LB approved the burr-free campsite. We enjoyed a delicious fajita dinner prepared on the grill thanks to Caroline Moody while staring up at the Super Moon, the closest and largest full moon of the year! Lake Travis is popular for swimming, boating, skiing, and whatever other water activities you can think of. The Park is busy, so if you are looking for peace and quiet or you have a horse that spooks easily then this may not be the place for you, especially on the weekends. However, there are several benefits to camping with your horses at Lake Travis. 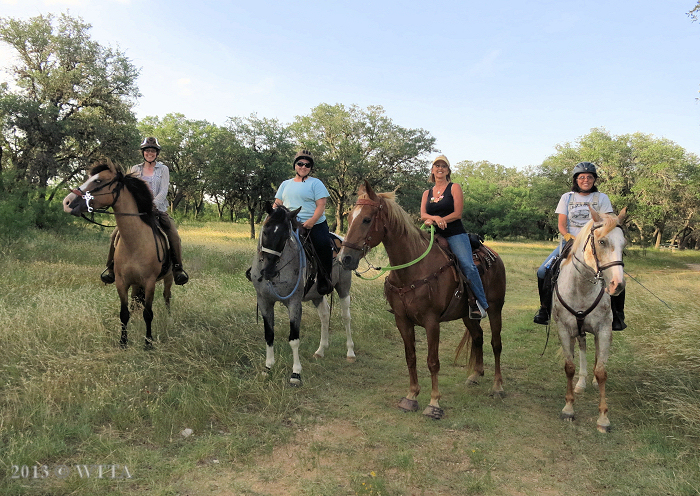 You are not limited to just horseback riding, which makes it fun for your non-riding friends as well. Swimming in the lake after a long hot ride is an added bonus to this location. 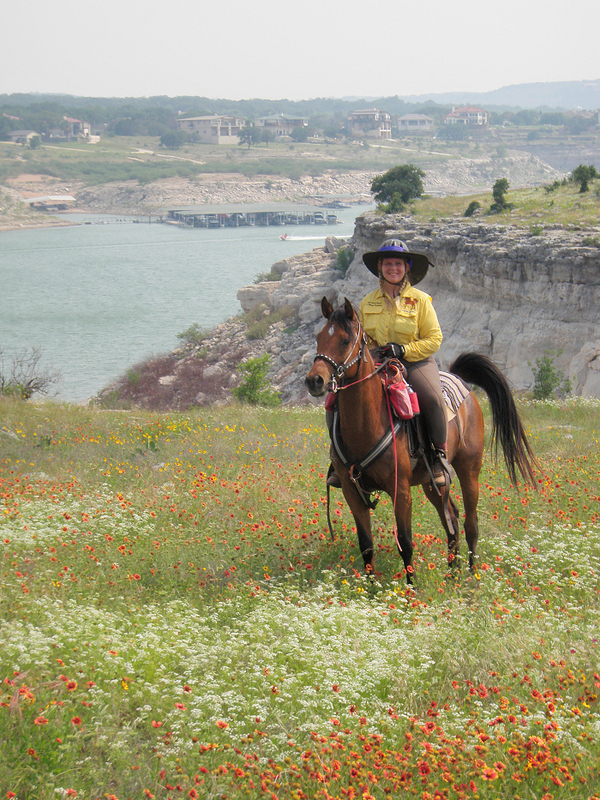 On my first trip to Pace Bend Park, I had the privilege of going horseback riding and kayaking in the same day. Thanks to Carol Grosvenor who amazingly managed to stuff five kayaks in her truck and trailer, along with her horse and camping gear, several friends and I had our first kayaking experience. Now I’ve become a fan of kayaking but I don’t have to let that infringe on my riding time by enjoying both activities at Pace Bend. See you on the trails or in the water! Recommended equestrian camping is in Mud Cove. Once in the park turn right on the main road (it splits) and then look for bathroom #11. Hikers and bikers only trail marker. Water trough near trail #208. Heading out to the trails.